For your convenience, we have added online purchasing capabilities. Check out our online store for great deals on all our apparel and merchandise! Visit us for an Hour! It's a Great Day at Lake Gaston Resort! Lake Gaston is the home of one of the Mid-Atlantic's premiere outdoor resorts - The Club Resort at Lake Gaston. The Club Resort is nestled along the Virginia banks of Beautiful 20,000-acre Lake Gaston and offers an exclusive private country club atmosphere for its members and guests. Enjoy the best of nature, unwind along the private beach, or head up to the exclusive, multi-million dollar Clubhouse. Whether you enjoy boating, water skiing, fishing, swimming, or the excitement of jet skiing, we provide the gateway to the warm, fresh water and 350 miles of shoreline of Lake Gaston. Your family deserves the vacation memories awaiting in south central Virginia's wooded wonderland on the water - The Club Resort at Lake Gaston. Do You Have A Special Promotion Code? 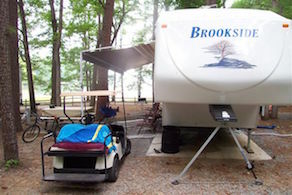 This could be you enjoying your reserved camping site at Lake Gaston. Book your visit to THE CLUB/Lake Gaston Resort online. Check availability, confirm your reservation, and pay with our new online reservations system! Click here to book your visit! Weddings, Conferences, and Family Reunions. If you are looking for a great venue for your wedding, a business conference, fishing group, or just a family reunion, you need to explore all of your options for having your event at Lake Gaston Resort. Our Special Functions Coordinator will work with you to customize your event to meet your individual needs. Click on the 'Conferences/Weddings' tab above for more information. Lock in your cost of camping NOW!! We all know that in today's economy, the cost of everything will continue to rise, including camping. Wouldn't it be nice if you could lock in your camping fees and keep them there for years to come? You can do just that at THE CLUB/Lake Gaston Resort. We make it so simple for you to camp at Lake Gaston. Go ahead and peruse our website, look at all of our amenities, read more about our programs and then set up a time to see for yourself all that Lake Gaston Resort has to offer. See you soon! More information on our programs. Sign up to receive emails on upcoming events, activities, bowling reports, Rendezvous Restaurant specials and other newsworthy items. More information on signing up. The Family Fun & Fitness Center sets Lake Gaston Resort apart from all other camping resorts! The Family Fun and Fitness Center is located on the grounds of Lake Gaston Resort and offers amenities that are unmatched anywhere. Whether you want to bowl, workout, swim, play shuffleboard, racquetball, mini-golf or amusement games, the Family Fun Center is the place to be. We also serve fantastic tasting pizza, hamburgers, sodas and a full line of adult beverages. Just look at what you can be doing when you visit Lake Gaston Resort! People really do win at The Club/Lake Gaston Resort! Some of our lucky winners! Families who visit The Club/Lake Gaston Resort under certain special promotions are eligible to win major prizes. Anthony and Martha Purtle of Rocky Mount, NC won $15,000 Cash! Here are some of the lucky families who have won in the past.